Trick-or-treating is supposed to be fun. Kids dress up, run around, knock on doors, and feast on a sweet candy bounty. But for 15 million Americans—including one in 13 kids—Halloween is a dangerous and disappointing event. 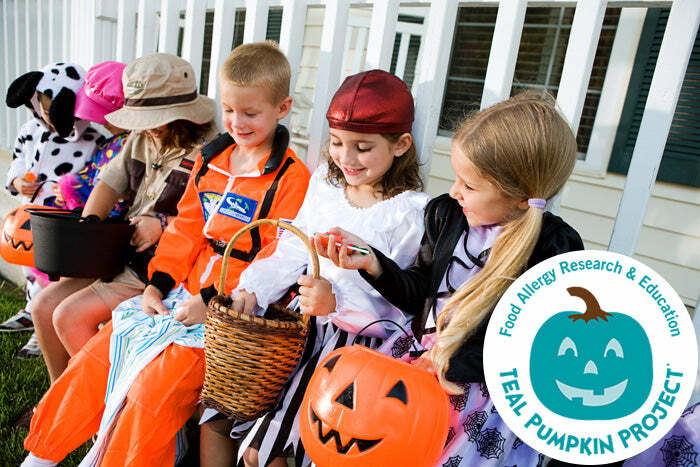 To give every child with allergies and conditions the ability to enjoy Halloween, FARE’s Teal Pumpkin Project® was founded. Today, this movement promotes safe trick-or-treating alternatives for kids with food allergies, so the only scary part about Halloween is the costumes. Teal Pumpkin Project was inspired by a group in Tennessee, and launched as a national campaign by Food Allergy Research & Education in 2014. In 2015, it was incorporated by people in all 50 states and 14 countries. Now, Teal Pumpkin Project is a bonafide worldwide food safety initiative that helps raise awareness about child food allergies and make Halloween a positive experience for everyone. Anyone from any country can participate in Teal Pumpkin Project when you do one or all of the following. Thanks to conscientious people like you, Halloween can be safe and fulfilling for every child. Remember, use this guide as a stepping stone for candy to offer children with all dietary needs, but don’t follow it blindly. If your child has a serious allergy, always carry an EpiPen® and read labels yourself. It’s better to be safe than sorry! Disclaimer: CandyStore.com is in no way offering medical advice and isn’t licensed to do so. These are simply guidelines you can use to make Halloween safer for every child. To stay 100 percent safe, you should always read ingredient labels and consult a doctor before feeding your child questionable candy.